"PSNI" redirects here. For other uses, see PSNI (disambiguation). The Police Service of Northern Ireland (PSNI; Irish: Seirbhís Póilíneachta Thuaisceart Éireann; Ulster-Scots: Polis Service o Norlin Airlan) is the police force that serves Northern Ireland. It is the successor to the Royal Ulster Constabulary after it was reformed and renamed in 2001 on the recommendation of the Patten Report. Although the majority of PSNI officers are Ulster Protestants, this dominance is not as pronounced as it was in the RUC because of positive action policies. The RUC was an armed police force and played a key role in policing the violent conflict known as the Troubles. As part of the Good Friday Agreement, there was an agreement to introduce a new police service initially based on the body of constables of the RUC. As part of the reform, an Independent Commission on Policing for Northern Ireland (the Patten Commission) was set up, and the RUC was replaced by the PSNI on 4 November 2001. The Police (Northern Ireland) Act 2000 named the new police service as the Police Service of Northern Ireland (incorporating the Royal Ulster Constabulary); shortened to Police Service of Northern Ireland for operational purposes. All major political parties in Northern Ireland now support the PSNI. At first, Sinn Féin, which represented about a quarter of Northern Ireland voters at the time, refused to endorse the PSNI until the Patten Commission's recommendations were implemented in full. However, as part of the St Andrews Agreement, Sinn Féin announced its full acceptance of the PSNI in January 2007. In comparison with the other 44 territorial police forces of the United Kingdom, the PSNI is the third largest in terms of officer numbers (after the Metropolitan Police Service and Police Scotland) and the second largest in terms of geographic area of responsibility, after Police Scotland. The PSNI is about half the size of Garda Síochána in terms of officer numbers. The senior officer in charge of the PSNI is its Chief Constable. The Chief Constable is appointed by the Northern Ireland Policing Board, subject to the approval of the Minister of Justice for Northern Ireland. The Chief Constable of Northern Ireland is the third-highest paid police officer in the UK (after the Commissioner and Deputy Commissioner of the Metropolitan Police). Each district is headed by a Chief Superintendent. Districts are divided into areas, commanded by a Chief Inspector; these in turn are divided into sectors, commanded by Inspectors. In recent years, under new structural reforms, some Chief Inspectors command more than one area as the PSNI strives to make savings. In 2001 the old police divisions and sub-divisions were replaced with 29 District Command Units (DCUs), broadly coterminous with local council areas. In 2007 the DCUs were replaced by eight districts ('A' to 'H') in anticipation of local government restructuring under the Review of Public Administration (RPA). Responsibility for policing and justice was devolved to the Northern Ireland Assembly on 9 March 2010, although direction and control of the PSNI remains under the Chief Constable. PSNI officers have full powers of a Constable throughout Northern Ireland and the adjacent United Kingdom waters. Other than in mutual aid circumstances they have more limited powers of a Constable in the other two legal jurisdictions of the United Kingdom—England and Wales, and Scotland. Police staff, although non-warranted members of the Service, contribute to both back office, operational support and front line services, sometimes operating alongside warranted colleagues. The protocols for these movements of personnel were signed by both the Chief Constable of the PSNI and the Commissioner of An Garda Síochána on 21 February 2005. The PSNI also has an education organisation named 'B safe', created by Dympna Thornton in 2006. The PSNI is supervised by the Northern Ireland Policing Board. The Police Ombudsman for Northern Ireland deals with any complaints regarding the PSNI, and investigates any allegations of misconduct by police officers. Police staff do not fall under the Ombudsman's jurisdiction. The current Police Ombudsman is former Oversight Commissioner Dr Michael Maguire, who took over from Al Hutchinson in July 2012. The Oversight Commissioner was appointed to ensure that the Patten recommendations were implemented 'comprehensively and faithfully', and attempted to assure the community that all aspects of the report were being implemented and being seen to be implemented. The Oversight role ended on 31 May 2007, with the final report indicating that of Patten's 175 recommendations, 140 had been completed with a further 16 "substantially completed". The PSNI is also internally regulated by its Professional Standards Department (PSD),who can direct local "professional standards champions" (superintendents at district level) to investigate relatively minor matters, while a "misconduct panel" will consider more serious misconduct issues. Outcomes from misconduct hearings include dismissal, a requirement to resign, reduction in rank, monetary fines and cautions. The PSNI was initially legally obliged to operate an affirmative action policy of recruiting 50% of its trainee officers from a Catholic background and 50% from a non-Catholic background, as recommended by the Patten Report, in order to address the under-representation of Catholics that had existed for many decades in policing; in 2001 the RUC was almost 92% Protestant. Many unionist politicians said the "50:50" policy was unfair, and when the Bill to set up the PSNI was going through Parliament, Minister of State Adam Ingram stated: "Dominic Grieve referred to positive discrimination and we hold our hands up. Clause 43 refers to discrimination and appointments and there is no point in saying that that is anything other than positive discrimination." However, the Northern Ireland Human Rights Commission cited international human rights law to show that special measures to secure minority participation were in accordance with human rights standards and did not in law constitute 'discrimination'. By February 2011, 29.7% of the 7,200 officers were from a Catholic background, but among the 2,500 police staff (non-warranted members), where the 50:50 rule operated only for larger recruitment drives, the proportion of Catholics was just 18%. The British Government nevertheless proposed to end the 50:50 measure, and provisions for 'lateral entry' of Catholic officers from other police forces, with effect from the end of March 2011. Following a public consultation the special measures were ended in respect of police officers and police staff in April 2011. Deloitte conducted recruitment exercises on behalf of the PSNI, and was the dominant firm in the Consensia Partnership which existed from 2001 to 2009. As of 2017, the PSNI have announced that it will be introducing new schemes to increase the number of Catholics in the force. The PSNI is focusing on tackling the fear factor of joining the Service as violent dissident Republicans are discouraging Catholics from joining and continue to attack Catholic officers. In September 2006 it was confirmed that Assistant Chief Constable Judith Gillespie approved the PSNI policy of using children as informants including in exceptional circumstances to inform on their own family but not their parents. The document added safeguards including having a parent or "appropriate adult" present at meetings between juveniles and their handler. It also stressed a child's welfare should be paramount when considering the controversial tactics and required that any risk had been properly explained to them and a risk assessment completed. Armed Response Unit (ARU) officers are trained, equipped and deployed to support district colleagues by dealing with spontaneous and pre-planned incidents where people are armed with firearms, knives and other weapons. Some of these people will be involved in crime; a significant number of others will be suffering from mental illness or at points of crisis within their lives, posing a danger to themselves and others. The PSNI ARU provides 24/7 cover to all of Northern Ireland. All officers in the ARU have to complete and pass a rigorous selection process and nationally approved authorised firearms course. The firearms course provides the officers with the skills to deal with armed suspects on foot, vehicle and search for armed suspects in buildings and open areas. During the course officers will also have to successfully complete the police advanced drivers course, the tactical pursuit course, advanced first aid and fitness tests. As well as being equipped with conventional firearms, armed response officers are equipped with various less lethal technologies including attenuating energy projectiles and Tasers. They also have a fleet of performance vehicles as well as Land Rovers and armoured cars. Headquarters Mobile Support Unit (HMSU) officers are trained to Specialist Firearms Officer (SFO) and Counter Terrorist Specialist Firearms Officer (CTSFO) standards. HMSU officers undergo a 26 week training program including firearms, unarmed combat, roping, driving, close personal protection and photography. HMSU is the tactical unit of the PSNI. Tactical Support Group (TSG) officers are trained in a range of specialist tactics and deliver a highly versatile mobile resource supporting District Policing colleagues across all of Northern Ireland. TSG provides uniformed support to investigative departments including Organised Crime Branch, Major Investigation Teams and Criminal Investigation Department (CID). TSG regularly supports partner agencies including the National Crime Agency, HM Revenue & Customs, and UK Border Agency. Core TSG functions include public order, search, method of entry, counter terrorism and crime reduction, community safety, response to major crime scenes and a surveillance capability. TSG also provides specialist support to maritime and roads policing operations. Specialist Search Teams – support the investigation of serious crime including murder and terrorism; prepare for VIP visits; respond to reports of missing persons. Method of Entry – officers are trained to use specialist tools and equipment to gain entry to premises in support of search operations or to reach vulnerable people. Specialist Counter Terrorist / Anti-Crime Patrols – these patrols are intelligence led and provide hi-visibility security in areas of specific threat. The patrols support operational colleagues including Neighbourhood and Local Policing Teams. Marine Response – TSG coxswains crew four rigid-hulled inflatable boats. These are used to support sea, river and inland water operations, including search, counter terrorism and missing person investigations. TSG coxwains also support major policing operations including VIP visits and maritime festivals. Enhanced Medical Aid – TSG officers are trained to provide an enhanced level of first aid and trauma care. High Risk Escorts – The movement of high risk and high value consignments (including explosives, munitions, cash, and persons) is conducted by TSG officers. CBRN – TSG officers are trained to respond to Chemical Biological Radiological Nuclear incidents using specialist protective clothing and equipment. Close Protection – some TSG officers are trained to support the Close Protection Unit. Roads Policing – some TSG officers are trained to support the Roads Policing Unit. Mutual Aid – on request TSG provides Specialist Mutual Aid to other UK Police Services. Public Order – TSG officers are trained to the highest national standard in public order policing (Level 1). TSG supports the policing of large public events and responds to incidents of public disorder. TSG also supports public safety by patrolling interfaces and the night time economy. The colour of the PSNI uniform is bottle green. Pre-1970s RUC uniforms retained a dark green called rifle green, which was often mistaken as black. A lighter shade of green was introduced following the Hunt reforms of the early 1970s, although Hunt recommended that British blue should be introduced. The Patten report, however, recommended the retention of the green uniform (Recommendation No. 154). The RUC officially described this as 'rifle green'. When the six new versions of the PSNI uniform were introduced, in March 2002, the term 'bottle green' was used for basically the same colour to convey a less militaristic theme. The flag of the PSNI is the badge in the centre of a dark green field. Under the Police Emblems and Flags Regulations (Northern Ireland) 2002 no other flag can be used by the PSNI and it is the only one permitted to be flown on any PSNI building, vehicle, aircraft or vessel. PSNI officers routinely wear bulletproof vests and in recent years have been issued the stab vests worn by most UK police officers and the Gardaí. Beginning in December 2007 bulletproof vests were required for PSNI officers patrolling in the Greater Belfast and Greater Derry City areas owing to the threat from dissident republicans. In 2009 the PSNI issued an upgraded and redesigned bulletproof vest to operational officers. While the bulletproof vest offers a high level of ballistic protection many officers prefer the lighter and more comfortable stab vest. Both are issued to each operational officer and the wearing of body armour generally comes down to personal preference, except in areas of high threat. Due to the elevated threat level police personnel face from armed paramilitary groups, unlike the majority of police services in the United Kingdom, the PSNI routinely arms its officers with personal protection weapons and allows its officers to carry their issue sidearm off-duty. Officers are issued the Glock 17 pistol, phasing out the now considered obsolete Ruger Speed-Six revolvers previously issued up until 2002. Long arms are also issued: either the Heckler & Koch MP5 which has been issued since 1992 replacing the Sterling Mk. 3 SMG or Heckler & Koch MP7 submachine guns, the Remington 870 shotgun and the Heckler & Koch G36C assault rifle. Long arms are still routinely carried in areas of higher threat such as Derry Cityside, North and West Belfast or various border areas. Previous long arms included rifles such as Heckler & Koch G3s or HK33s which replaced Ruger AC-556 select fire rifles. The best known PSNI vehicle is the Land Rover Tangi but with the improving security situation these are less likely to be used for everyday patrols and are more likely to be used for crowd control instead. In 2011 it was announced that some of the Tangis were to be replaced, due to the ongoing security threat and the age of the current fleet. This led to the creation of the PANGOLIN - Armoured Public Order Vehicle - designed and built by OVIK Special Vehicles (part of the OVIK Group), 60 Mk1 and 90 Mk2 variants have been delivered and are currently in service. Also a number of Public Order Land Rovers made by Penman are also currently in service. Other vehicles include Škoda Octavias, Škoda Superb, Vauxhall Vectras, Vauxhall Astra estates, Ford Mondeos, Volkswagen Passat Estates, Audi A6, Audi A4. Vans include Volkswagen Transporter, Volkswagen Crafter and Mercedes-Benz Sprinter. 4X4 vehicles include Mitsubishi Shoguns, Range Rovers, Land Rover Discovery 4s and a small number of Honda quad bikes. Higher spec cars include Volkswagen Golf R32s, Vauxhall Vectra VXRs, Mitsubishi Lancer Evolution and Vauxhall Insignia VXRs. Many older armoured vehicles are still in use. The PSNI have a fleet of Honda and BMW R 1200 RT motorbikes. The PSNI also have a fleet of 242 bicycles which are used for city centres and walkway patrols. In 2014 the Air Support Unit responded to over 4,000 callouts, 12 were Casualty evacuations and participated in over 250 missing people searches. All aircraft are used for investigations, anti-crime operations, traffic management, search and rescue, public order situations, crime reduction initiatives and tackling terrorism. In May 2005 the PSNI took delivery of its first helicopter, a Eurocopter EC 135, registration G-PSNI and callsign Police 44. In 2010 the PSNI took delivery of its second aircraft, a Eurocopter EC 145 registration G-PSNO and callsign Police 45 at a cost of £7 million. In July 2013 a third helicopter entered service, Eurocopter EC 145, registration G-PSNR and callsign Police 46. The PSNI also has access to two fixed wing aircraft both of which are Britten-Norman Islanders. The first was delivered in 1991 which is still in service registration G-BSWR and callsign Scout 1. In 2010 a second fixed wing aircraft registration G-CGTC, callsign Scout 2 entered service. Other items of equipment include Hiatt Speedcuffs, CS (irritant) Spray, Monadnock autolock batons with power safety tip and Hindi cap, a first aid pouch, a TETRA radio (Motorola MTH800) and a torch with traffic wand, Limb Restraints, finally the PSNI plan to distribute 2100 BlackBerry devices to officers by the end of March 2011 and by March 2012 they plan to distribute an additional 2000 devices. The service's headquarters are located in Knock, an area in east Belfast. The ranks and their insignia correspond to those of other UK police services, with a few modifications. Sergeants' chevrons are worn point-up as is done in the United States, rather than point-down as is done in other police and military services of the United Kingdom. Sergeants do not wear numbers as their counterparts do in other UK police services. The six-pointed star & saltire device from the PSNI badge is used in place of the Crown in the insignia of superintendents, chief superintendents and the chief constable. The rank insignia of the chief constable, unlike those in other parts of the UK, are similar to those of the Commissioner of Police of the Metropolis and the Commissioner of the City of London Police. Weitzer, Ronald. 1995. Policing Under Fire: Ethnic Conflict and Police-Community Relations in Northern Ireland (Albany, New York: State University of New York Press). Weitzer, Ronald. 1996. "Police Reform in Northern Ireland", Police Studies, v.19, no.2. pages:27-43. Weitzer, Ronald. 1992. "Northern Ireland's Police Liaison Committees", Policing and Society, vol.2, no.3, pages 233-243. ^ "Funding in focus as Board approves PSNI Budget". NI Policing Board. Archived from the original on 19 October 2014. Retrieved 1 September 2014. ^ "Freedom of Information Request : Police Dogs Owned and/or Used by PSNI" (PDF). Psni.police.uk. Retrieved 1 August 2015. ^ "Faisnéis as Gaeilge faoi Sheirbhís Póilíneachta Thuaisceart Éireann" (PDF). 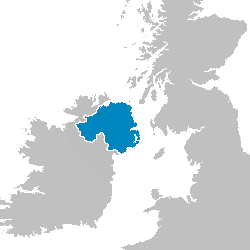 Police Service of Northern Ireland (in Irish). Archived from the original (PDF) on 18 March 2009. Retrieved 2 March 2009. ^ Russell, Deacon (2012). Devolution in the United Kingdom. Edinburgh University Press. p. 218. ISBN 0748669736. ^ "A New Beginning : Policing in Northern Ireland" (PDF). Cain.ulst.ac.uk. Retrieved 1 August 2015. ^ a b "Police (Northern Ireland) Act 2000". Statutelaw.gov.uk. Retrieved 1 August 2015. ^ "SF delegates vote to support policing". RTÉ News. rte.ie. 28 January 2007. Retrieved 5 June 2007. The Sinn Féin decision in favour of supporting policing in Northern Ireland for the first time ever has been welcomed in Dublin, London and Belfast. ^ "Police Pay Review". Police-information.co.uk. Retrieved 1 August 2015. ^ "Committee A (Sovereign Matters) on Cross Border Cooperation between Police Forces" (PDF). British-Irish Parliamentary Assembly:. July 2008. Archived from the original (PDF) on 11 December 2013. ^ "Freedom of Information Request : Human Resources" (PDF). Psni.police.uk. Archived from the original (PDF) on 2 April 2014. Retrieved 1 August 2015. ^ "Workforce Composition Figures | Police Service of Northern Ireland". Psni.police.uk. 1 October 2008. Retrieved 1 August 2015. ^ "PSNI allowed to use child informers". UTV News. u.tv. 1 September 2006. Archived from the original on 30 September 2007. Retrieved 5 June 2007. The Police Service of Northern Ireland policy, 'Children as Covert Human Intelligence Sources' was approved by Assistant Chief Constable Judith Gillespie in February 2005 as part of its child protection policy. In June 2009, Judith Gillespie was promoted to the rank of Deputy Chief Constable, the high rank obtained by a female. ^ "CAIN: The Patten Report on Policing: Summary of Recommendations, 9 September 1999". Cain.ulst.ac.uk. 9 September 1999. Archived from the original on 13 May 2008. Retrieved 27 May 2017. ^ "Police Emblems and Flags Regulations (Northern Ireland) 2002". Opsi.gov.uk. 5 July 2011. Retrieved 1 August 2015. ^ McDonald, Henry (13 December 2007). "Belfast police forced back into flak jackets". The Guardian. London. Retrieved 10 March 2009. ^ "Northern Ireland". Encarta. msn. Archived from the original on 27 August 2007. Retrieved 5 June 2007. Unlike police forces in the rest of the United Kingdom, the PSNI is an armed force. ^ "OVIK: CROSSWAY Armoured and Special Role Vehicles and Chassis". Oviks.com. Retrieved 1 August 2015. ^ "Penman" (PDF). Penman.co.uk. Retrieved 1 August 2015. ^ "Freedom of Information Request : Use of Bicycles by PSNI" (PDF). Psni.police.uk. Archived from the original (PDF) on 3 April 2014. Retrieved 1 August 2015. ^ PSNI (2015). April 2015, Keeping People Safe PSNI, Belfast. ^ "Northern Ireland police service orders EC145 helicopter - CJI Main Site". Corporatejetinvestor.com. 14 March 2013. Retrieved 1 August 2015. ^ "Civil Aviation authority : Mark G-PSNR" (PDF). Caa.co.uk. Retrieved 1 August 2015. ^ "Civil Aviation authority : Mark G-BSWR" (webpage). Caa.co.uk. Retrieved 5 August 2015. ^ "Civil Aviation authority : Mark G-CGTC" (webpage). Caa.co.uk. Retrieved 5 August 2015. ^ "Freedom of Information Request : Blackberry Mobile Phones=Psni.police.uk" (PDF). Archived from the original (PDF) on 2 April 2014. Retrieved 1 August 2015. Wikimedia Commons has media related to Police Service of Northern Ireland.